Since Spring has finally arrived, I’ve been on an endless mission to get my house organized and decluttered. It seems like every winter more and more things accumulate, and half the time I don’t even know where they come from!? Each room in my house has a different set of issues…from a garage that looks like it should be on an episode of Horders, to kitchen cabinets that explode every time they’re opened! 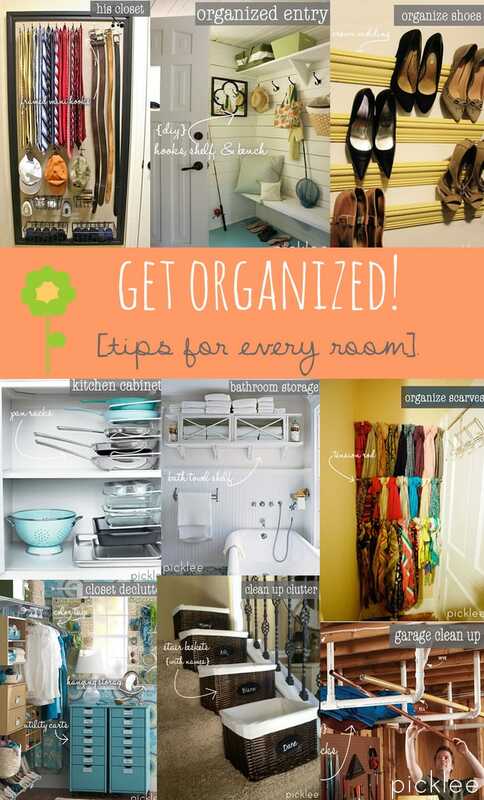 So I searched & searched, and found some GREAT organizing solutions for all of my clutter issues…I’m willing to bet that many of you have some of the same clutter issues, so I hope this helps you get your home back on track too! Limited storage space in the bathroom? Try a simple mounted shelf/cabinet! 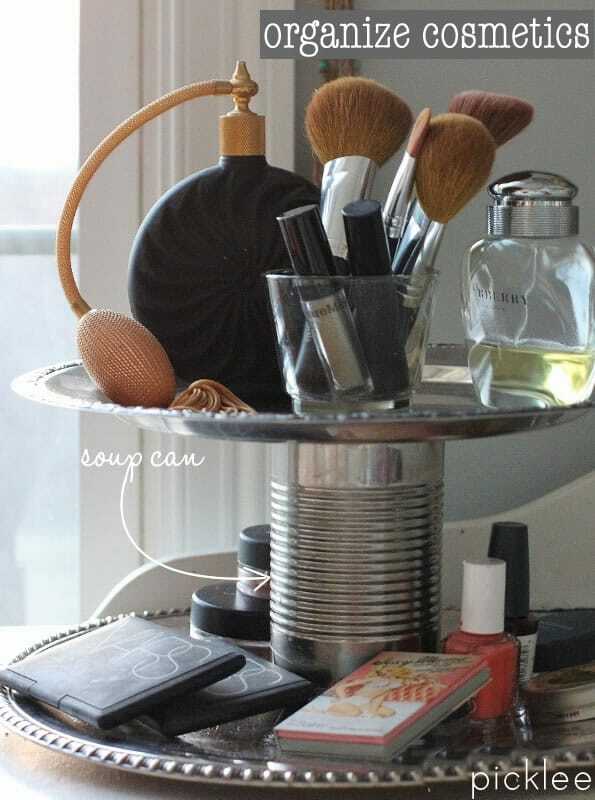 Make a two-tier organizer by mounting two plates onto a recycled soup can using hot glue. Find the tutorial here! Too many scarves, can never seem to find the one you’re looking for? 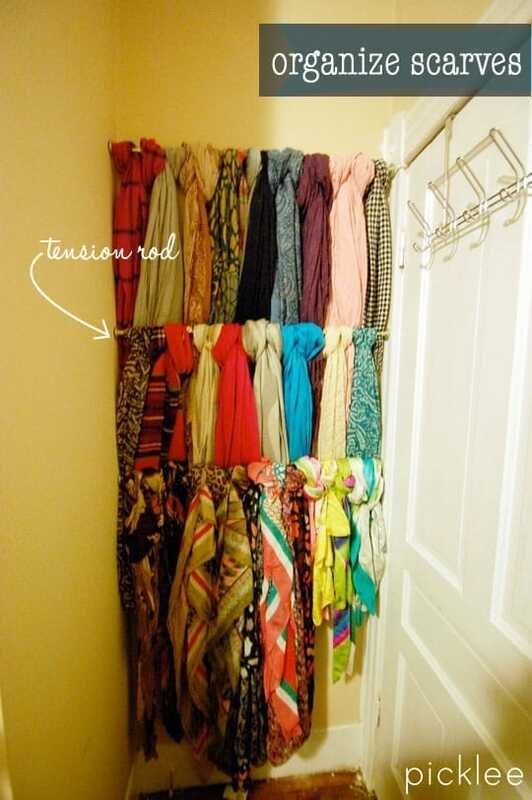 Try mounting tension rods between two walls for a perfect scarf display! Clutter and junk always collecting around the house? 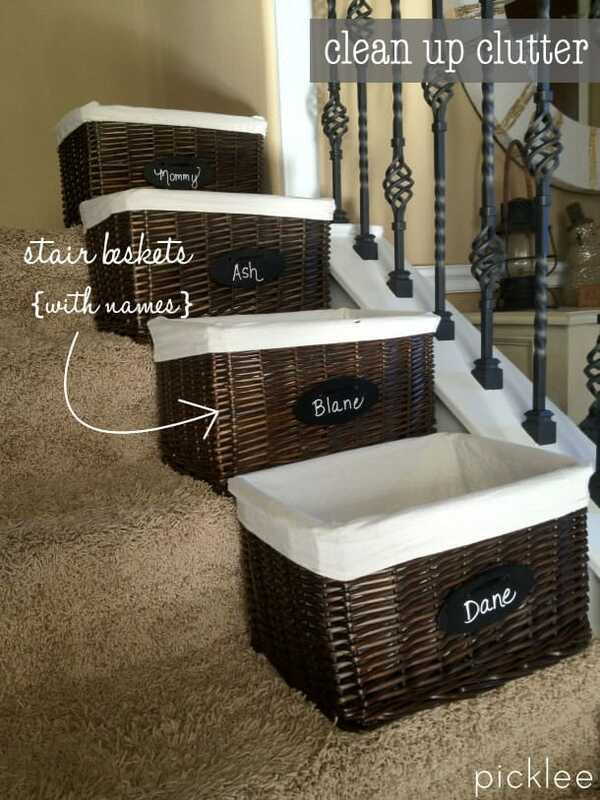 Try placing small baskets on the stairs for each family member. When they go upstairs, they take their junk! Does your entryway make a bad first impression? 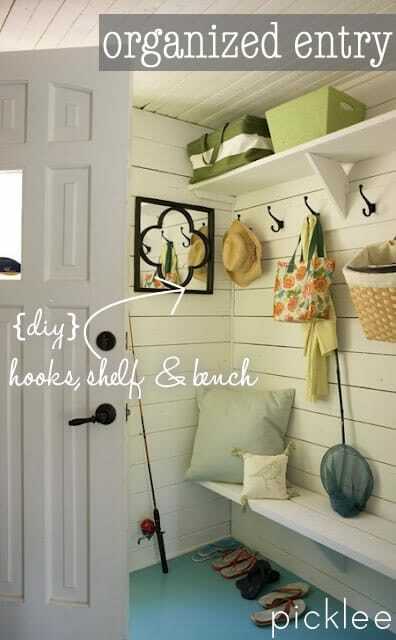 Start a little weekend project…add coat hooks, a wall mounted bench seat, and storage shelf. Family members will be forced to hand and store their loot! Does your garage look like it should be on an episode of Horders? 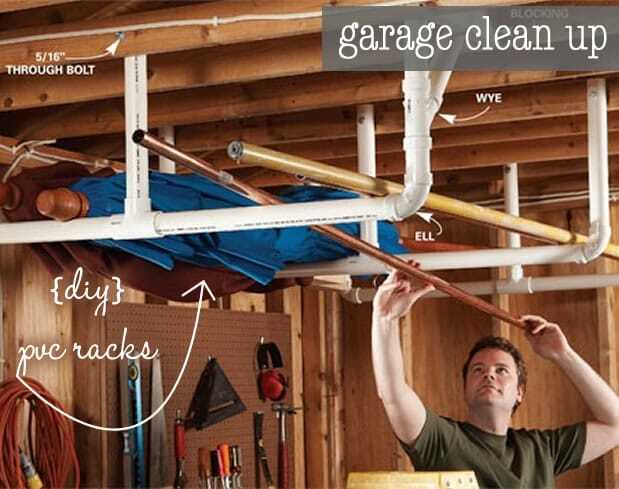 Try mounting PVC pipes to the ceiling to create simple & inexpensive racks! 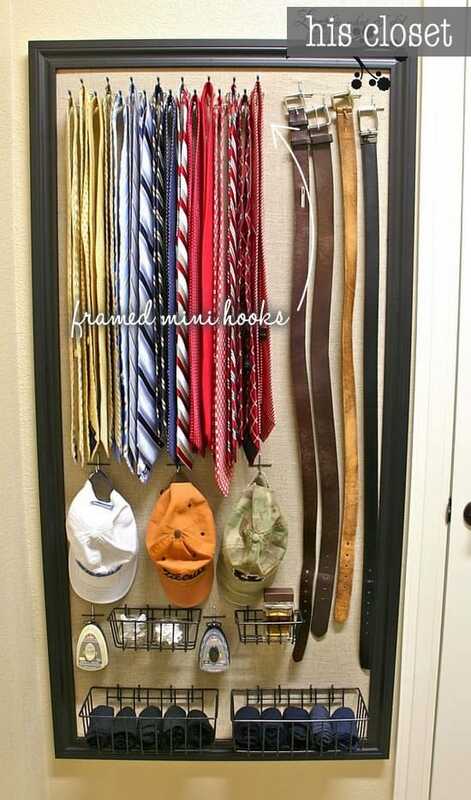 To store his belts, ties, and accessories, try mounting little hooks to a open wall, then mounting a bare frame to create a cohesive look! Is your closet being overtaken by mass amounts of shoes? Try mounting strips of crown molding on a bare wall to create instant heel storage! Find the tutorial here! Is your closet constantly full of STUFF with no place to go? 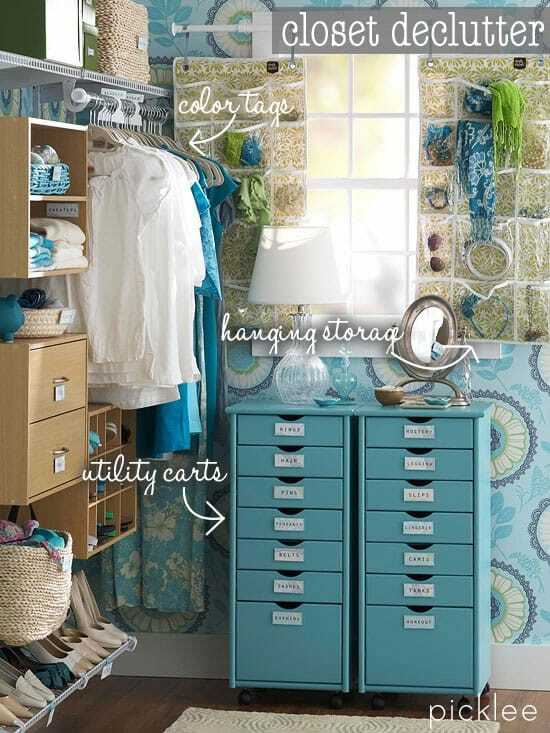 Try a variety of simple closet solutions, like hanging storage pouches, utility carts, baskets, and color separation tags for clothes! Pots and pans spilling out from your cabinets constantly? Try these great cabinet racks, made specially for mounting on cabinet walls. You can purchase them here! I’m off to go start organizing! If ya’ll have more de-clutter tips PLEASE DO SHARE! We can all benefit from them! I just have to say that I am extremely impressed by you. This is my first time visiting your website, which I found by chance, and I am completely inspired! I have been going green, upcycling and DIYing everything and anything I can for almost 6 months (a year but the first half does not count lol) now and I now find myself more inspired with new found creativity! Thank you for all your hard work. Such smart tips, thanks! I’ve always been bad at organising stuff. I just don’t do this. 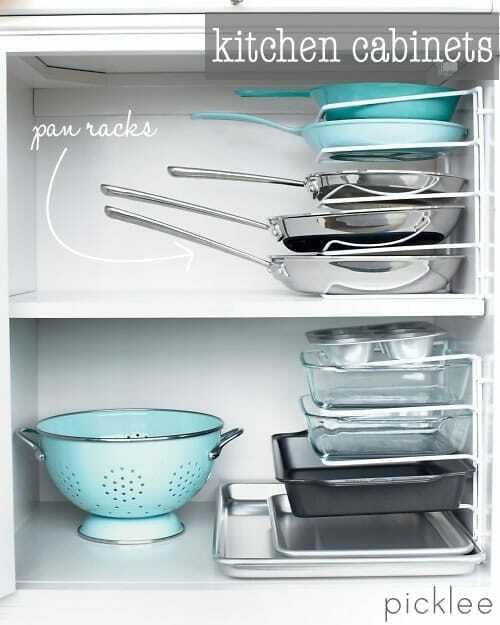 The last picture of your post suggests me that the most unordered area in my house are the kitchen cabinets where I store pots and pans. I’ll give your tip a try, definitely. You are great! Keep up with publishing awesome content!